10 Facts You Might Not Know About Claude Monet's "Water Lilies"
1) Water Lilies is not a name of a single painting, but a name of a series of works. During his lifetime, Claude Monet comes back to this subject matter several times, and painted more than 250 water lilies paintings. Along with Starry Night by Vincent van Gogh, Water Lilies are the most iconic images of Impressionism. 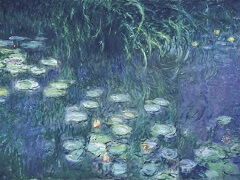 2) The first series of "Water Lilies," a total of twenty-five canvases, was exhibited at the Galerie Durand-Ruel in 1900. This was followed nine years later by a second series of forty-eight canvases. "These landscapes of water and reflection have become an obsession," wrote Monet on August 11, 1908. "This is beyond the strength of an old man, and yet I want to express what I feel. I have destroyed some of the canvases. I begin once again. ... I hope something will come of all this effort." 3) In all of the "Water Lilies" paintings, Monet focuses on the surface of the water. He dispenses with any representation of the land or sky, only showing their reflection in the water. These paintings are typical with willows present only as a reflection. The sky, with its white clouds, is reflected in the water, so the blue of the sky and the blue of the water are one. Only the presence of the water lilies helps the observer to understand that this is a reflection. 4) Monet planted the water lilies before he painted them. 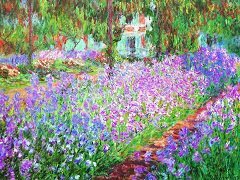 Monet organized his property at Giverny as though it were a huge painting. Thanks to a small army of gardeners, he diverted a river, planted water lilies, exotic flowers, weeping willows, bamboo trees, and willows. He seeded the pond and added enclosures with white chickens, ducks, and pheasants. Nature, recomposed by the artist, began to resemble his art. "My finest masterpiece," he later said, "is my garden." 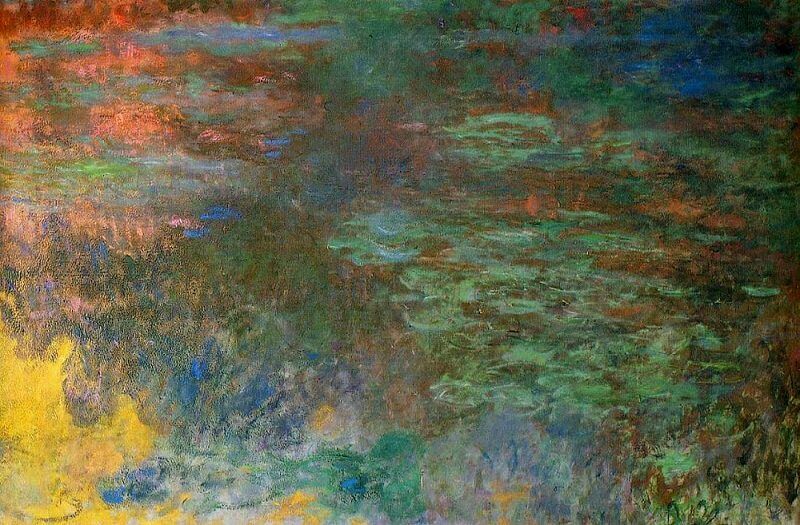 5) When Monet come back to his water lily paintings in 1914 following the death of his beloved wife Alice in 1911. he made some radical changes in his approach, namely in the scale of the canvases. They were monumental in scale, most measuring around two metres (six feet) square. He also changed his palette ond used brilliant spots of colour to suggest the flowers. His avant-garde approach and his extraordinary use of point and colour began the trail for subsequent art movements: his contemporary Paul Cezanne became affiliated with Post-impressionism; Henri Matisse, who had studied Monet, became of the first of the Expressionist artists. 6) By the time Monet embarked on his last monumental series of water lily paintings, he had gained critical and commercial success. This gave the artist added freedom to explore motifs of his choice and paint to his own schedule. Although he returned again and again to the water lilies, it was a subject that caused him difficulties, and he worried about the paintings, often reworking them. Monet has focused on colour: the clash of green trees as their reflection creeps into the violet-blue depths of the pond's water. He has used small accents of complementary reds, pinks and yellows in the buds of the lilies that sit atop curiously colourless lily pads using expressive, but smooth brushwork. 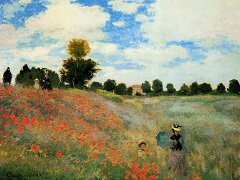 7) Prime Minister Clemenceau had always been a loyal supporter of Monet's work. In 1914 he urged the artist to work on a larger project, which became a formal state commission in 1916. This was for a set of large canvases depicting water lilies that would be displayed together permanently. 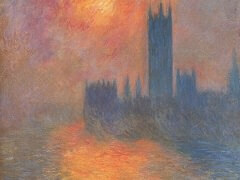 Between now and his death this was to be the main preoccupation of Monet's work. 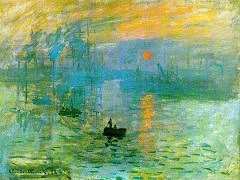 8) At the age of eighty-two Monet discovered that he had a cataract. The deterioration of his eyesight was horrifying to the artist, who wrote, 'I realized with terror that I could see nothing with my right eye .. a specialist... told me that I had a cataract and that the other eye was also slightly affected. It's in vain that they tell me it's not serious, that after the operation I will see os before, I'm very disturbed and anxious,' In 1923 he was operated on three times to try and correct his right eye. 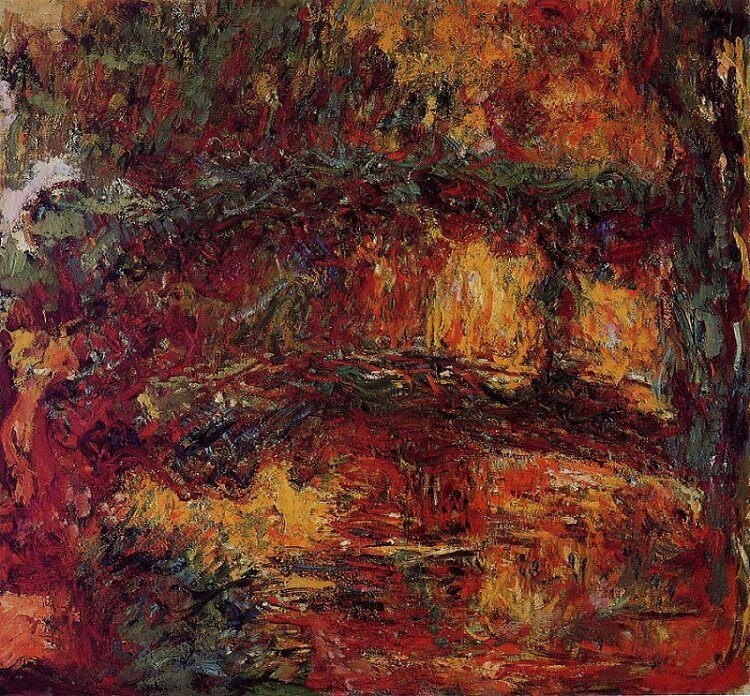 The brilliant fiery reds and yellows of Water Lilies - Japanese Bridge, 1923 are indicative of the impaired sight of the artist, seeing his bridge within a reduced palette. Yet it is the most evocative sum of colour and light and composition, creating on overall startlingly emotive effect. 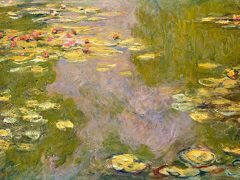 9) Water Lilies opened the path to abstract painting. By the time of Monet's death in 1926 the art world, both in Paris and in America, was a very different place from the one he had largely struggled against during much of his life, Monet and his circle were the first to truly challenge the conventions of Parisian art in the modern age, and by doing so and progressing their works towards greater understanding of colour and light, they opened the door for successive generations of artists. Monet and his contemporaries broke down barriers and persevered in their artistic quest against great hardship in order to achieve a freedom of expression that is now taken for granted. Towards the end of his life, Monet's work increasingly reflected a form of abstraction through his simplification of composition and reduction of all unessential elements. By doing this ond through his obliquely structured compositions ond focus on pure vivid colour, he set a precedent for later artists, particularly those of the Post-impressionist, Expressionist and Abstract-expressionist movements. 10) Water Lilies Series in the Orangerie, Paris is the last sery that Monet worked on before he died. 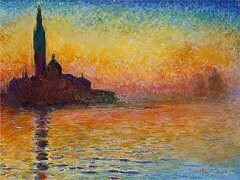 In 1917 Monet's friend, the politician Clemenceau, was elected Prime Minister of France (for the second time) and told Monet that the State would purchase 12 of the monumental paintings and house them in a specially designed building. Clemenceau was not re-elected in 1920, but the commission continued and, after extensive communications, it was decided to adapt the Orangerie in the Tuileries to create the space reguired to display Monet's works. In early 1926 he told Clemenceau he was 'waiting for the paint to dry'. On 5 December 1926 the artist died. 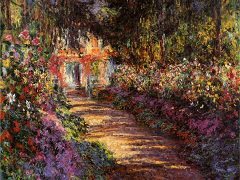 The canvases were taken from his studio and the Orangerie was opened to the public in May 1927.